It seems the amount of information about IDL on the World Wide Web is increasing exponentially these days. Here are a few of my favorite links. Each site listed here has links to other related sites. If you would like to have your site listed here, send me an e-mail and I will include it. The place to start any search for any IDL-related material is the ITTVIS homepage. Here are a few other sites you might also wish to look at. Johns Hopkins Applied Physics Lab IDL Web Page. 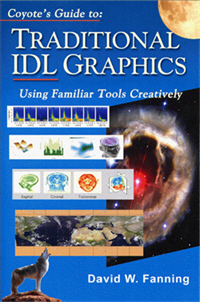 This site contains some of the best examples of IDL programs, in a variety of categories. I wouldn't think of writing a new IDL program unless I checked here to see if it had already been written. Be sure to download the catalog of one-line program descriptions. IDL Astronomy Library World Wide Web home page. This site is a general repository of general purpose IDL astronomy routines. If you are looking for a routine to read FITS files, this is the place to start. You can browse through a list of one-line descriptions and download the files directly. This site is fast becoming my "go to" site when I am looking for interesting code. 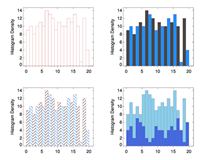 The curve fitting routines Craig offers are superiour to the ones that come with IDL, and there is an excellent curve fitting tutorial here, as well. In addition, you will find some of the best array manipulation routines to be found anywhere on the web. The routine CMSET_OP for performing set operations (intersection, union, and exclusive OR) is great, as is CMAPPLY, a program that can flexibly perform almost any mathematical operation on an array or a portion of an array. You owe yourself a look at this site. This extensive library at ForschungsZentrum Jülich contains over 900 useful routines. Each is extremely well documented and tested. Perhaps the easiest way to access these routines if via their handy catalog. Select a routine of interest, then select the database icon for the routine to learn more about the library dependencies for each routine. If you select the Get Source button now, you get a compressed tarball containing the source for all the library routines you need. Very nice. The library routines are released under the GNU Library General Public License. In addition to being a place to purchase Ronn's three fine IDL books, you will find a variety of shareware and freeware. For example, you can find an IDL implementation of a genetic algorithm (e.g., for solving the traveling salesman problem), code for implementing a sun-clock on a map, dynamic link modules for working with WAV and AVI files, and much more. Definitely worth having a look. Liam Gumley's IDL Web Page at the University of Wisconsin. Liam is another person who has become a major programming resource in the IDL community. You will find a number of useful screen capture and color handling programs on this site. But I often send folks here for his satellite image mapping tool, IMAGEMAP. This is the only program I know that takes satellite image pixel data, with corresponding latitude and longitude coordinates, and places them on a map projection. You will also find a nice HDF browser for looking as SDS data sets. Have a look. Ken Bowman's IDL Web Page. 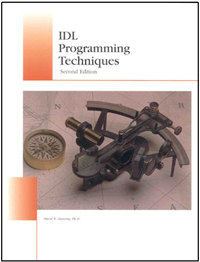 Ken has written an introductory book about IDL. You can find information about the book and the programs that go with it on his web page. Ken is also a Macintosh user and his web page has become a wonderful source of Macintosh tips for those of us using Macintosh computers for scientific research. Rick has done a lot of work in 3D object graphics. His camera object is absolutely terrific. It serves as a replacement for the IDLgrView object and gives you the opportunity to look at a scene from your point of view, whereas normally the graphics scene looks at you. (Folks, I didn't write the original code! 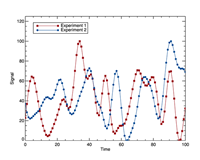 But I can tell you this is a much more natural way to work with data.) Also, if you are looking for quaternions, here is the place. This site is a must for working with 3D object graphics. And if you have an older version of IDL for Windows and you need more user interactivity, look at Rick's directInput.dlm. Now you, too, can have a joy stick to navigate your 3D objects! J.D. Smith created the GNU Emacs modes for editing IDL files and running IDL as an inferior shell. This IDLWAVE mode is now bundled into EMACS itself. You can find the latest release, tutorials, etc. here. Everyone who uses this mode swears by it. Mark has been doing some interesting work with IDL object programming. You can find some of his utility routines as well as some nifty object classes on this site. In particular, have a look at his MGHgrGraph code for a simple X-Y graph object. There are methods for for adding axes, plots, annotations etc. The most convenient thing about it is that atoms added to the graph automatically have their scaling adjusted to fit the axes. Check out his MGHgrAnimator object for animating a sequence of object graphics pictures. You will also find tools for working with netCDF files among the programs in this excellent collection. University of Washington Astronomy World Wide Web home page. This site is notable for containing on-line help for over 3000 IDL procedures and functions written by users all over the world. In addition, you will find an excellent tutorial by Eric Deutsch on how to produce pretty PostScript output. Rob Dimeo's IDL Web Page at the NIST Center for Neutron Research. Rob is an excellent IDL programmer who understands curve fitting inside and out. 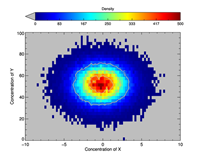 Here you can find DAVE (Data Analysis and Visualization Environment), an integrated environment for the reduction, visualization and analysis of inelastic neutron scattering data. One of the most interesting pieces of DAVE is a general purpose curve fitting program with a graphical user interface, named PAN, which can be downloaded separately. You can also find a neat little widget program that allows you to solve the Schrodinger equation in one dimension using the discrete variable approximation. Well worth having a look. Robert Dahni's IDL Web Page in Melbourne, Australia. Robert is a long-time IDL user at the Bureau of Meteorology in Melborne, Australia. He has been instrumental in organizing IDL user groups in Australia. Robert has done an excellent job of organizing extensive IDL web resources, especially those of interest to meteorologists. 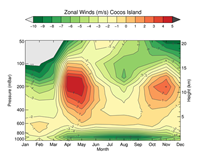 His Resources page is a must-read for those looking for coast and shoreline data sets. Mike is a former senior instructor and consultant for Research Systems. He is especially familiar with iTools and has a number of excellent articles and example programs on this site that deal with this subject. You will be especially interested in his IDLdoc code for generating nicely formatted and informative HTML documentation files of your own programs. Matt Craig maintains the TeXtoIDL package that allows users to use TeX style text formatting from within IDL. Users already familiar with LaTeX will find this package extremely familiar. Oliver Thilmann's Medical Imaging Library at Lund University. This site contains a number of IDL objects Oliver has written for working with MR images. The documentation is first-rate, and includes a number of example programs and data to get you up to speed quickly. Robert Barnett's IDL Web Page in Sydney, Australia. Robert is medical imaging programmer at Westmead Hospital in Sydney. His site includes software for working with DICOM images and Remote Procedure Calls (RPC). He has written an IDL object-oriented framework for creating medical imaging applications (Designed to work on E.Soft acquisition workstations). Current packages include software for renal and shunt analysis, gastric emptying, and gated heart pool.